I dissected their 2010 non-conference schedule at length when it was announced last week, but today we found out the exact dates and times for the entire 2010 Pitt Panthers football slate. Among the highlights: six games already scheduled for national TV, seven opponents who played in bowl games last season, the Backyard Brawl coming to the Burgh, and three Thursday night games. Like I said in the earlier post, this is not a pushover schedule by any means. The Panthers did themselves no favors with a challenging out-of-conference group of games this season, and again, I really don't like opening at Utah for a variety of reasons. On the bright side, at least no one can accuse the Panthers of going the cream-puff route. West Virginia also released their full 2010 schedule, with a non-con schedule featuring LSU, Maryland, Marshall, and UNLV. 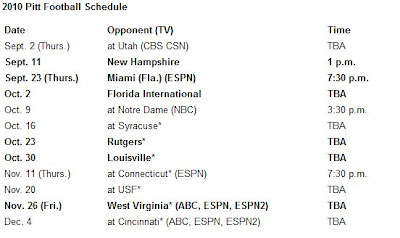 The Mountaineers will be on national TV at least four times, with two of those coming on a Friday and one on a Thursday. Like Pitt, the 2010 schedule is by no means a cake-walk for WVU, although I would be very surprised if they don't start off at least 4-1. You must be talking WVU. Pitt? 10-2. Loses at Utah, then at Cincinnatti. Bookends to the season. Kelly's gone, Pike's gone, Cincy's going down. I'm more worried about The U.